"Few performers can cough up a Number One single like “Dreams” as the third song in a set and then top it and top it again." SARATOGA SPRINGS – Singer Stevie Nicks is at the far side of 63, so it’s more than a little amusing to her hear her croon about “The Edge of Seventeen.” The song, though, is a rumination not on youth, but on death, and in that regard it takes on a different meaning as Nicks and her audience press on through the years. 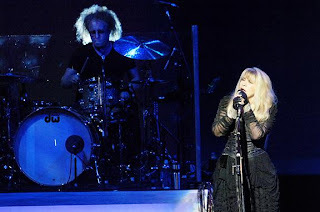 Nicks returned to the Saratoga Performing Arts Center on Tuesday night, closing her two hour show with “Seventeen,” which found a drum solo preceding not only guitarist Waddy Wachtel’s distinctive sixteenth note intro figure, but also a final costume change for Nicks. Truth be told, her costume changes are not as ambitious as they once were, and Nicks wore the same pair of black pants beneath each outfit. Her singing is not as ambitious either. Some songs have found their keys lowered, others have had their phrasing softened. But in place of that edge (pun intended), Nicks has found an easy comfort. She seems less pretentious now. And she’s goofy in a way she might have once worked hard to hide. In short, she seems more at home in her skin. When she would take a gossamer spin — slower and thicker in the middle than in her glory days — it seemed to have a touch of humor in it. In fact, the only misstep at SPAC on Tuesday was her tribute to the military, “Soldier’s Angel.” Her introduction to the song, and the accompanying video, seemed self-serving — more about Nicks than about the wounded soldiers themselves. The latter comes from Nicks’ latest effort, “In Your Dreams.” It’s her first album in ten years and she took the opportunity in Saratoga to sing selections from the disc. “Annabel Lee,” with lyrics borrowed from Edgar Allan Poe, sounded like classic Nicks, perhaps because the melody seems to borrow from “Dreams.” But the slide-driven “Ghosts Are Gone” rocked and “For What It’s Worth” received strong applause. Her tight band — led by the legendary Wachtel — made the new material spark just as much as the old. But it was clear from the crowd’s reaction — sit for the new stuff, jump up for the classics — that most had come to hear the nostalgic Nicks. She did not disappoint in that realm. Few performers can cough up a Number One single like “Dreams” as the third song in a set and then top it and top it again. But Nicks also revisited “Rhiannon,” “Gold Dust Woman” and “Landslide” from her Fleetwood Mac days. That soft phrasing made parts of “Rhiannon” sound almost unfamiliar, but “Dreams” was fresh and exhilarating. And “Gold Dust Woman” was given a long rock workout at the end. Nicks also has plenty of solo hits to show off, and “Stand Back,” “Leather and Lace” and “Seventeen” found their way onto the set list as well. “America’s Got Talent” star Michael Grimm opened the show with a set that was impressive in a solid bar band way. He capped it with the one-two punch of his own “Stay With Me” followed by Faces’ classic raver of the same name. Length: Grimm, 40 minutes; Nicks, 2 hours. Highlights: “Dreams” was a lovely step back in time. The Crowd: Nicks’ date was an amphitheater only show, but the space was filled with devoted fans.